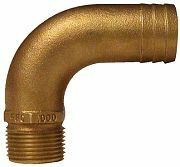 Used for connecting hose to valve, seacocks, strainers or any hardware having female NPT pipe threads. FFC fittings are designed to accommodate the designed full pipe size flow and to provide an unrestricted passage through the fitting. Fittings are cast bronze. A hex nut is cast-in to allow for secure tightening.